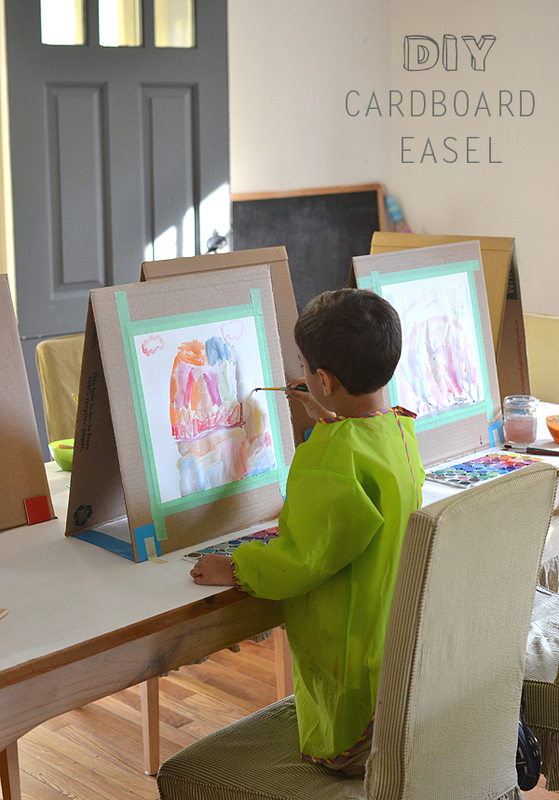 There are many ways to make a quick easel. I might have learned quite a few tricks if I had actually researched before I made this project. But I’m much more of a spontaneous planner, and I woke up on the morning of art class with an idea that my students should experience painting on a proper easel. I quickly went to the attic, where we still have mounds of brown boxes from our move last year, and I grabbed a few and brought them downstairs. The following is my solution to the DIY easel! 1. Start by cutting down your box. 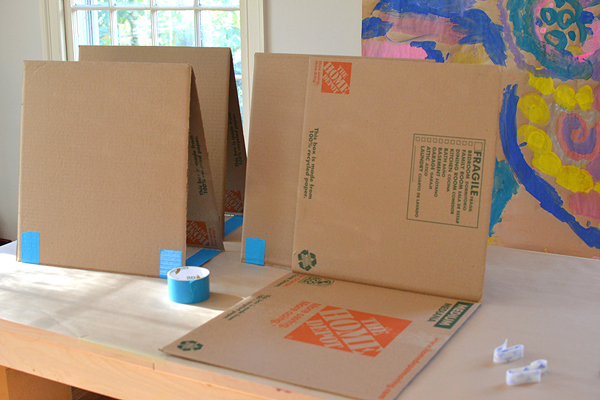 Cut off the top and bottom flaps of your box (save for possible painting project in the future). Now cut down two of the four sides. You should now have two hinged pieces. 2. 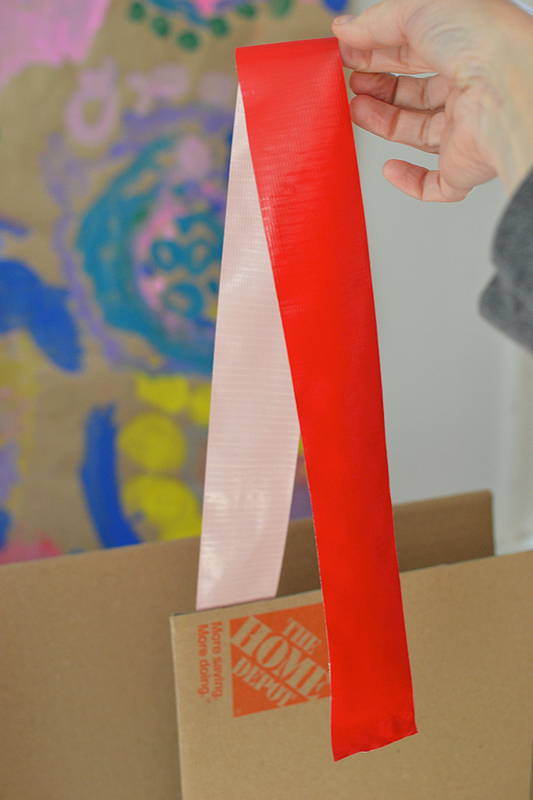 Cut a long piece of duct tape (about 26″). 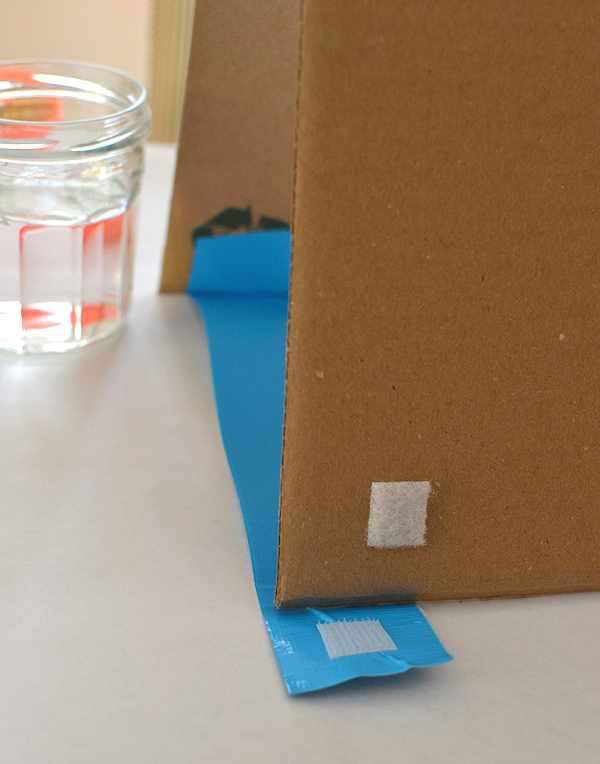 Tape the end to the bottom of the cardboard, then fold the tape over in half, taping it back on the other side of the cardboard. 3. 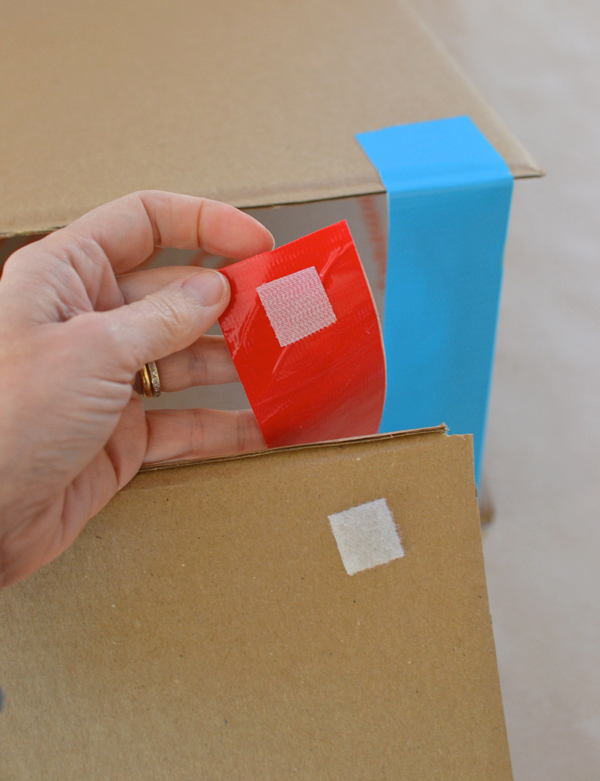 Cut a piece of sticky velcro and attach one to the duct tape and one to the cardboard. Done! I did add a piece of masking tape to stick the easels to the table as they are so light-weight that I didn’t want them moving while the kids painted. You could also just prop something up to the back. On this day I taped a piece of paper to their easels, but you could also add some bulldog clips to the top or sides and then it would be easy to add/remove paper in a jiffy. 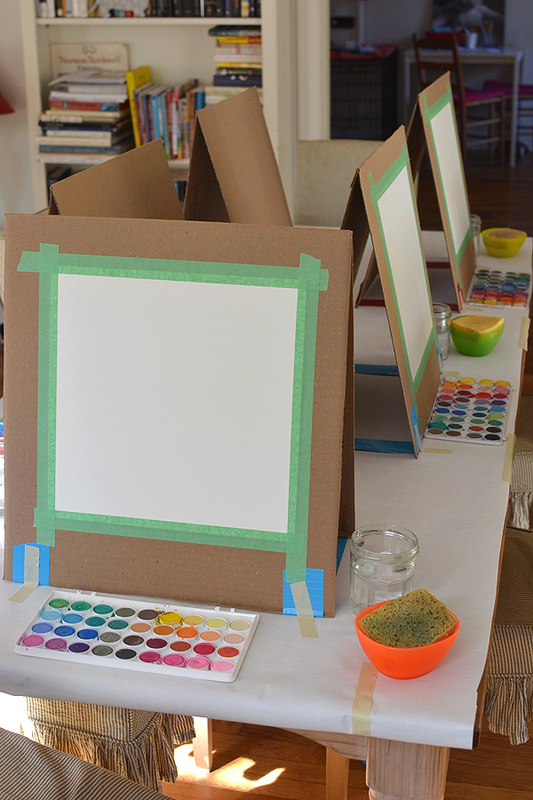 The best part about these easels are that they are so easy to fold up and store! Let me know if you try to make these and if you think of any clever, new tricks. Wow! I didn’t even read the whole thing about the cardboard easel yet, but the second I even saw the title, I was thinking about what an amazing and creative person you must be! I can’t wait to finish reading! These are great, Bar. I love that they fold away compactly when you’re done with them. LOVE! I love the watercolor trays! Where did you find them? I covered both sides with clear contact paper to make them easy to sponge off. Great idea! I’m doing a painting party for my daughter’s 13th birthday. They are painting acrylic painting, setting up a whole “class” in the garage. This is perfect as I’m looking for something cheap because I have to have about 10 – 15 of them. Thanks! this is brilliant!!! Totally making these for my students! I’m a 2’s teacher, and I used pizza boxes, works perfect!!???? Hmmm… you could use these, but you would have to put a weight behind them so they don’t slide back. then you could lean the canvas up against the cardboard. try with one and see how it goes! Thanks so much for this idea. I’m also planning a ladies paint and sip party. I plan to cut and glue the extra pieces of cardboard together to make a thick bar that I can hot glue or duct tape near the bottom of the easel to make a ledge for the canvas. Great idea. I wanted to let you know that I am featuring this in an art party roundup if you don’t mind. Thank you for sharing this project. With summer here, I need special things like this for my grandchildren. I just completed one for my granddaughter who is 4 and now I’m working on one for my 2 year old grandson. So, So easy and fun to do. I further decorated the easel with colorful duck tape, which my granddaughter choose and helped me apply. Thank you again. This post may not be recent, but it’s definitely still relevant! I’m disabled and finding a work-around for the supplies I desire but can’t afford is a real blessing! Thank you! I love this. I am thinking that I can turn this into a felt board easel as well. Definitely going to give it a try!!!! ooh, I love that idea Jackie! Sketchbook plus a decent size mirror taped onto one side of the page will be heavier I’m guessing. We’ll see. Thanks again! let me know if it worked, Karl! What a super idea. There is always a lineup at the easel. 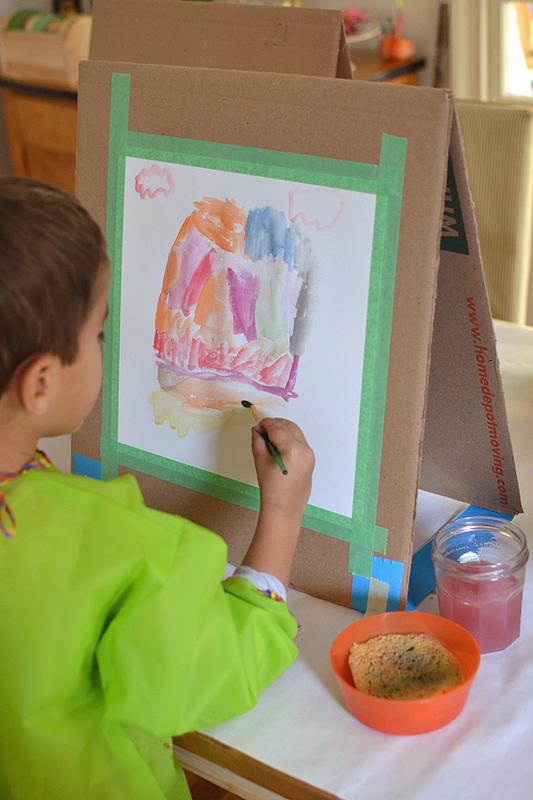 Now we can have more children using various mediums – paint crayons markers etc. And I am a huge fan of recycling.!! How many easels can be made from one box? Two? I am late to the party,but this is still a great idea! My 5 yr old has finally slowed down enough (he didn’t walk, he ran you get the idea) that he is now interested in drawing, and maybe painting. 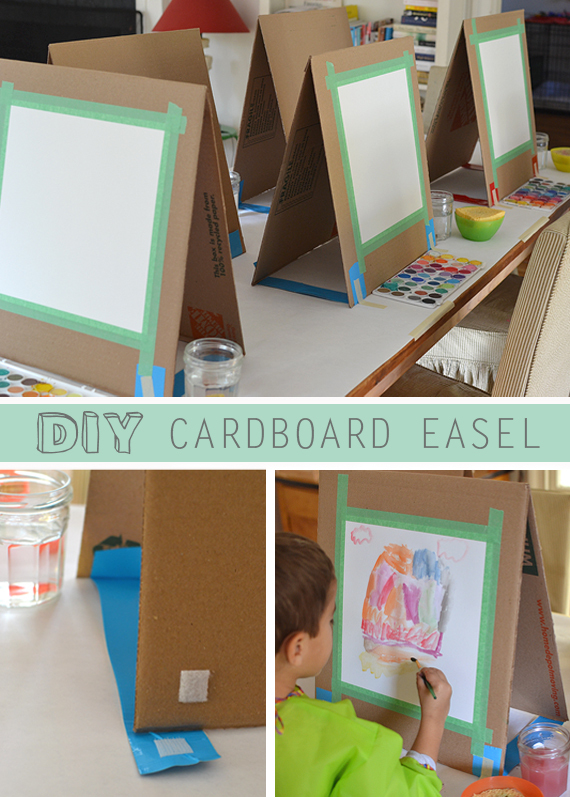 This cardboard easel will be great, and easy to put away!